The global luxury furniture market is expected to grow notably in the upcoming years. The key players in the market are rapidly working on establishing the manufacturing units in the developing economies owing to the low initial costs and investments. Aggressive marketing techniques are being used in the entire market by most of the leading players, to create a lasting impression among the consumers. Some of the major players operating in the global market are Nella Vetrina, Muebles Pico, Laura Ashley Folding PLC, Henredon Furniture Industries Inc., Scavolini S.p.A., Giovanni Visentin srl, Turri S.r.l, Iola Furniture Ltd, and Heritage Home Group LLC. According to a recent report by Transparency Market Research (TMR), the global luxury furniture market is estimated to expand at a steady CAGR of 5.2%, during the forecast period from 2017 to 2022. The market is prognosticated to reach around worth of US$29,496.7 mn by the end of 2022, from US$22,937.6 mn back in 2017. On the basis of material types utilized in making of furniture the market is led by wooden luxury furniture segment, with highest revenue in forthcoming years. This is attributed to the monetary value, durability of the material, and aesthetic value in the global luxury furniture market. Regionally, Asia Pacific is providing a huge scope for players in future. Particularly, China is expected to be one of the key revenue generating nation owing to rise in urbanization and increase in disposable income of the people. The pattern of safely online bill payment and e-shopping through net-banking is estimated to help the development of the market. In addition, with simple EMI alternatives and rise in number of middle class people are also ready to afford the cost of luxury furniture. 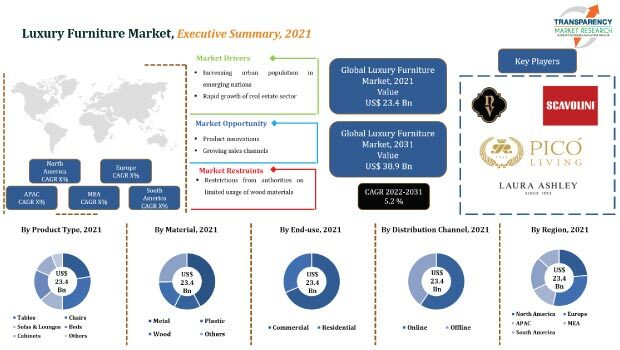 Moreover, rise in disposable income of the entire population is as well supporting the development of the luxury furniture market all over the globe. This is on the grounds that a rise in income has prompted people to shift from standard furniture to luxury furniture products. The growing tendency of buying luxury things as a sign of value of space and status symbol are among the key factors surging the demand for luxury furniture in the market. One of the difficulties hampering the development of the global luxury furniture market is the developing awareness among the buyers with respect to the negative effect on the nature on utilizing wooden furniture. As wood is a noteworthy income procuring material, it might influence the development of the market in the years to come. The developing accessibility of fake luxury material furniture which are valued at a much lower rate and worked with low quality materials is debilitating the development of the luxury furniture market. Nevertheless, the surging in real estate and construction sectors is foreseen to boost the development of the luxury furniture market. The pattern of safely online bill payment and e-shopping through net-banking is estimated to help the development of the market. With simple EMI alternatives and rise in number of middle class people are also ready to afford the cost of luxury furniture.